Doesn't this picture look like a great engagement photo? No? No, it's not pasta and tomatoes getting married. Just my sister and her fiance. So you're saying this is not really what you'd expect if I said I was going to take engagement photos for you? I was hoping to fool you. And everyone else in my family. The exciting news is that my youngest sister is getting married in August to a great guy that we all like. The not-so-exciting news for me is that since I'm the only family member living close to the happy couple (and partly because of my husband's dSLR that I have taken over for food photography) I get to try to take engagement pictures for them. And let me tell you, I know nothing about taking photos of people. Heck, it's taken me years just to start to figure out how to take pictures of food. And food doesn't have facial expressions. I feel like I should remind them what my food pictures looked like when I first started taking them (go ahead, check out this lovely one) and say that I'll be ready after practicing for a few years. Unfortunately, we're going to try to take the pictures this Saturday and not a few years from now, so in the meantime I'm cramming my head with all the portrait picture wisdom I can find: Full sun in midday = bad. Cloud day = good. The sun should be behind someone's shoulder but darned if I remember if it is me or the people in the picture. With all the cramming, time is a little short this week, so fast meals like this one are lifesavers. It is ready in less than 30 minutes and tastes like it was simmered for hours. You can use chicken sausage, wheat pasta and less cream to easily transform it into a healthy meal, or you can make it as written. Either way it is delicious. 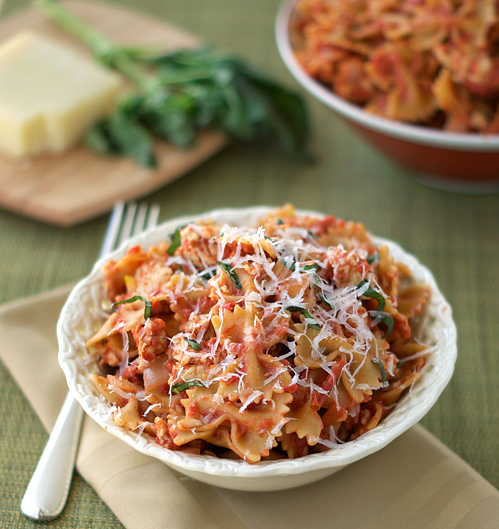 It does use fresh basil, which can be hard to find cheaply this time of year, but since the rest of the ingredients are inexpensive I feel like it is worth the splurge. It is definitely worth the flavor it adds. 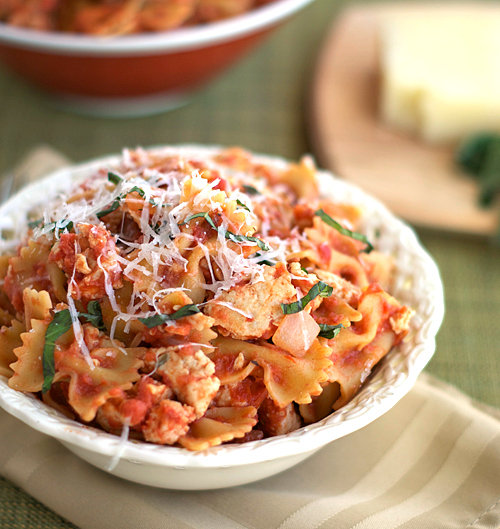 If you're looking for a fast weeknight meal, this is a perfect one to add to your collection. And seriously, are you sure this picture doesn't scream "engagement" to you? Looking at your early photos gives me hope that one day I can take pictures as nice as yours. Congratulations to your sister! What a fabulous time in her life, and a lovely pasta dish worth celebrating, too! This looks so delicious, Nicole. Definitely something I can see myself making soon! I think you will do great with the pics! Your pics here are stunning...I know, the subject sits perfectly still ...but talent is talent and you have it! Oh, thank you. It's lucky I enjoy taking food pictures because it certainly can be frustrating at times. The more I do it, though, the more I notice about what works and doesn't work for me. I'm sure it is the same for you. Good luck! I can completely relate - shooting food is SO much easier than people :) That said, I know you'll do a great job!! Love this pasta dish. My husband is always asking me to make more dishes with Italian sausage so he'll be psyched to see this one on the menu! OK I just found your blog and LOVE it. I can not wait to read more. Thank you! Thank you so much for the compliment. I hope you find some recipes that can inspire you! Congrats to your sister! I'm sure the pics will be great...if they're anything like your food pics it'll be a home run! I think that your sister and soon to be BIL look yummy:) All kidding aside I am sure that you will do just fine. I hear you on the taking pictures of people thing. These photos really do look fabulous though. Well done!